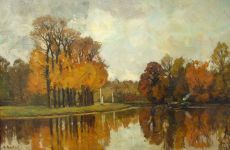 Syvert Nicolaas Bastert was a Dutch landscape painter of the nineteenth century. He is counted among the ‘second generation’ of the Hague School. Being born in 1854 into a prominent family, a career in marketing seemed destined at first, because of the success of his father’s trading company in Amsterdam. 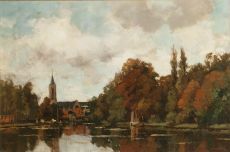 In 1876 however, Bastert applied to the National Academy of Fine Arts in Amsterdam,... Read moreSyvert Nicolaas Bastert was a Dutch landscape painter of the nineteenth century. He is counted among the ‘second generation’ of the Hague School. Being born in 1854 into a prominent family, a career in marketing seemed destined at first, because of the success of his father’s trading company in Amsterdam. 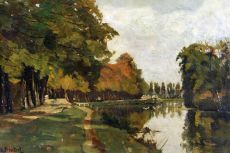 In 1876 however, Bastert applied to the National Academy of Fine Arts in Amsterdam, where his life took a different turn. In Amsterdam he met Geo Poggenbeek, with whom he would maintain a life-long friendship. 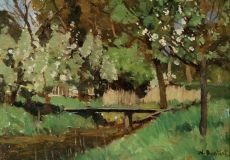 Basterts career initially started in Poggenbeeks studio, but in 1882 he established one himself.